Posted 18:33, revised 20:22: A couple of photos reached me today from a supporter of the “resistencia”. 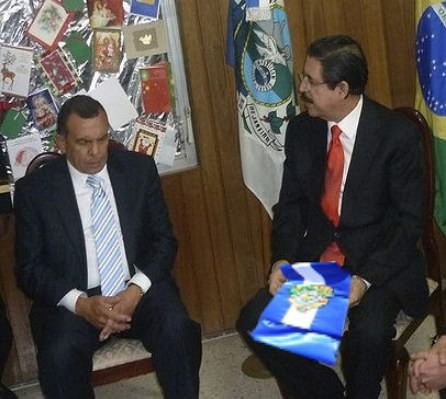 The document in which they were pasted claims that Porfirio “Pepe” Lobo went to the Brazilian Embassy with the US ambassador Hugo Llorens so that Manuel “Mel” Zelaya could pass the presidential band to the newly elected president, and thus claim legitimacy and have more countries recognize Honduras. Photomontage: Pepe Lobe and Mel Zelaya in the Brazilian Embassy in Honduras. The question is why someone made this montage. 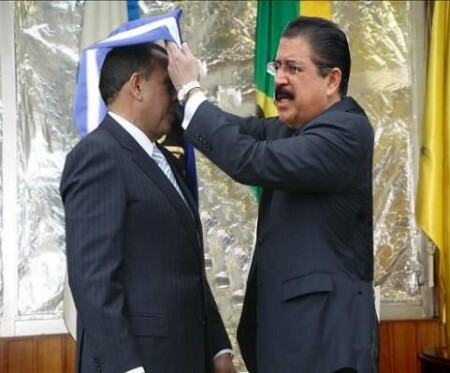 Photomontage: Mel Zelaya symbolically passes on the presidency to Pepe Lobo. The act, if it had taken place, would have meant different things to different people. For some it would have meant that Mel no longer could claim that he is the legitimate president of Honduras (or that Pepe not is the legitimate president now). For others, it would have meant that Pepe acknowledged that Mel was the legitimate president, and for still some, that Pepe was a traitor. In any case, the purpose seems to have been to discredit Pepe Lobo, and to inflate the image of Mel.